Downwinder from Hampton to Port Melbourne, nice! The sea breezes have finally arrived. After a quiet morning, a nice 18 knot southerly came in during the afternoon. I headed to Hampton and decided on arrival to do a downwinder. I rigged up the Noise 12m and setup my GPS, kitecam and linemount video. Lots of gear to record the trip! I took my waterproof backpack with foam sandals, the kite bag, boardshorts and rash vest, and some money for the trip home. 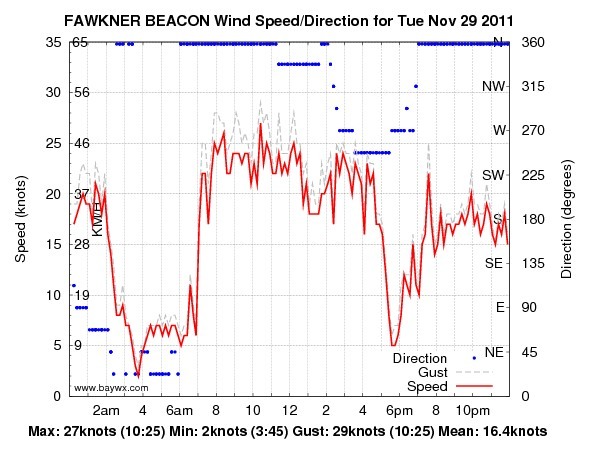 I did a run out to have a look around, came back to the breakwater, then headed off downwind. I cruised out past Green Point, then came in to the reefs, then headed down to Brighton. There were some nice bay swells to cruise down, and I rode toeside a bit to rest my legs. I did a couple of tacks and Brighton among about 10 kiters, then headed out offshore past a yacht that was motoring back to Brighton Marina. I tacked back towards the marina breakwater then back out towards Elwood. There were a couple of kiters and windsurfers at Elwood. I came in close the beach, then did a small jump. Unfortunately, my kite did a Hindenburg as I swung under it and hit the water. It inverted as I tried to relaunch it while I drifted slowly to shore. Then I got lucky and relaunched it about 100m from the beach - persistence sometimes pays off! 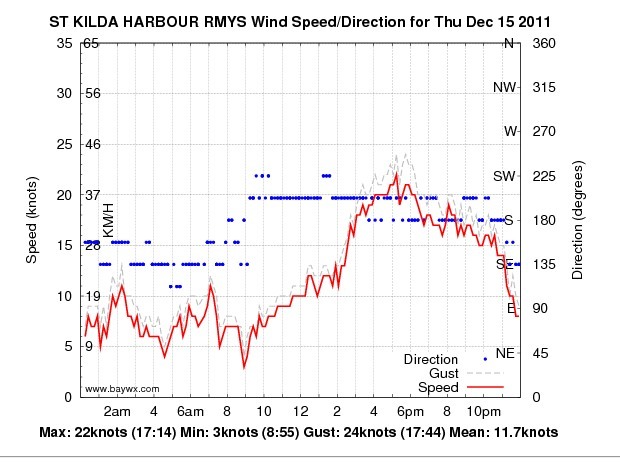 The wind had dropped a little, or there is a wind shadow at Elwood, but there was enough for me to head out past St Kilda breakwater. The water was getting noticeably dirtier (brown) as I headed up the bay. I was contemplating heading in to St Kilda, but the few kites in the air were going nowhere, so I headed towards Port Melbourne. The wind dropped further and I had to work the kite hard to keep moving. About 500m of the beach it fizzed out to 10 knots, so I did figure 8s to get into the beach. I ditched the kite just offshore then swam in and grabbed it. I packed up my gear on the nice grass next to Port Melbourne Lifesaving Club, had a coffee and ice cream at the shop there, then walked to get the tram at Port Melbourne. I returned to Hampton by tram to Southern Cross, train to Richmond, change for Sandringham line, train to Hampton, then a short walk back to the beach. I chatted to an elderly man who was interested in the gear, and the trip. 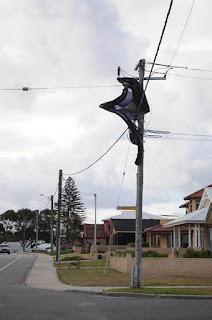 He was returning from the Melbourne Cricket Club having just watched the Boxing Day test of Australia vs India. His grandsons kite too (Tribe Carew) so he as quite interested in kitesurfing. This really is a great downwind tour. Stuart and Tarren were on the beach back at Hampton. Stuart had just finished a session - the wind having picked up again, and Tarren headed out for some more. The switch on the Contour Roam waterproof housing seems to be difficult to turn off. I thought I turned it off at the destination, yet in continued to record in my bag when returning. 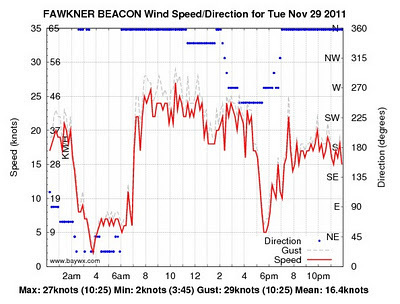 A 15 knot south easterly was blowing later in the afternoon so Stuart and I headed to Mentone. Once on the water the wind picked up so a brisk 20-25 knots which was great fun. I did some "Bondi Tram" runs - bar right out and still screeching along at 40km/h! I depowered the Noise 12m a few times, using the "leash over the depower nob" trick. The water was clean, the sun was shining and the wind was good. I popped a couple of nice high jumps, but lost my board landing one of them. Upwind body dragging didn't get me far upwind - I think I should have powered up the kite fully - but Stuart came by and fetched my board. There were only about 4 kites out, and two windsurfers. I was stationary in the water well offshore resetting my depower when one kamikaze windsurfer came straight at me with speed. It was a bit un-nerving watching this large board heading straight for me. He eventually passed me just upwind, which mean a big gust could have blown him onto me. His buddy did the right thing and passed me downwind at a safe distance. Later, Stuart said he had a close encounter when the same windsurfer came up very close behind him. Stuart took evasive action to keep away from him. There is plenty of room out there and no need to go past someone else so fast and so close. If this windsurfer is reading this, back off please! 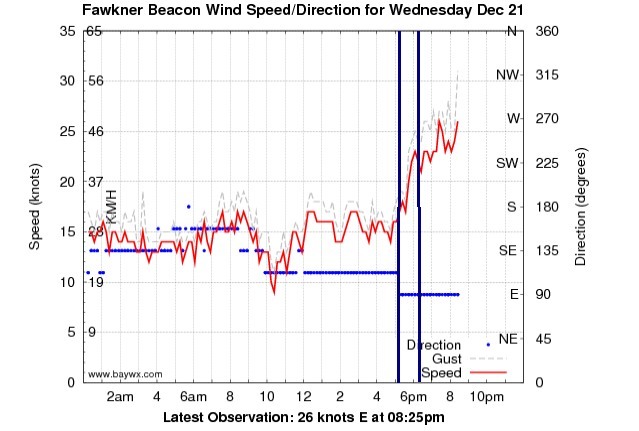 We stopped at about 6pm, with the wind getting even stronger. Nice to have a good stiff sea breeze, even if it was a bit unpredictable. I stuffed up the control on my Contour Roam video so no footage - there is only one switch but it looks like I need to practice using it. 17km and 43km/h max speed. Overall a great session. An interesting video, but I have to say I don't recommend this practice! Spectacular though, all the same. In the lead up to the "silly season" I wish a merry Christmas and a happy and safe New Year. Keep clear of no boating zones - designated by yellow buoys. 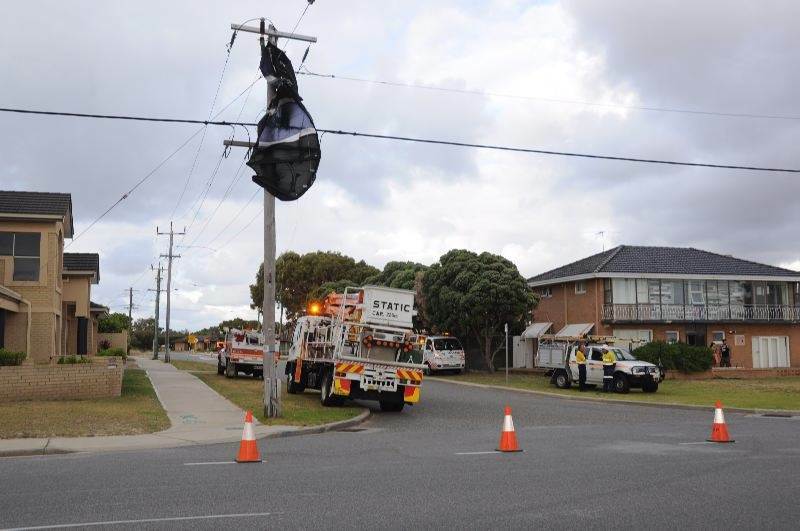 Its vitally important that we do everything we can to keep kitesurfing safe for ourselves and for others. Avoid flying your kite on the beach near other beach users, they do not understand kites and may walk into your kite or lines, or grab hold of them. 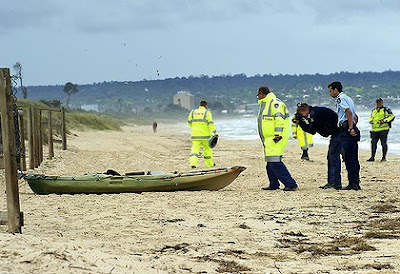 When doing downwinders or kiting in the surf zone pay attention to any surfers or swimmers, they may be under the surface or behind whitewash and not visible initially. It is best to either avoid known swimming/surfing spots, or do a slow approach to carefully check if anyone is in the water before entering the surf zone at each beach you pass. In Western Australia and Victoria there have been recent incidents involved a loose kite flying into power lines and cutting off power to 4000 homes for 8 hrs. While these kites may not have belonged to an AKSA member, the local community does not make that distinction and we could all be banned from these locations. use a kite leash that disarms the kite so it does not fly away. Distance is the best insurance, if you don’t get close to other beach/water users or dangerous objects then they can’t hurt you or you hurt them. 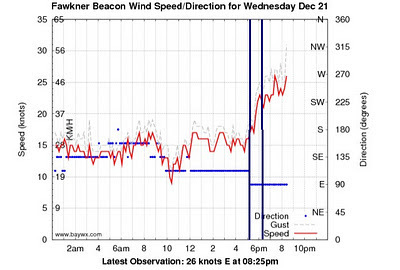 Have a safe Christmas with lots of great wind and time on the water. A late sea breeze sprang up late in the afternoon so I met Stuart at Port Melbourne for a really nice kitesurfing session. Stuart was already on the water, so I rigged up my Noise 12m kite without delay, mounted my new Contour Roam video camera with the Kitehero Line Mount and headed out. After a few tacks we headed along offshore to the east. There was quite a nice small bay surf rolling in. It was a glorious day with good sunshine and not too hot. Once again, it was really nice to be on the water. I did a few small jumps, but the wind backed off a bit so jumping became difficult. Its nice cruising towards the large Spirit of Tasmania ferry that was loading cars and getting ready to depart. It sailed away when were out of the water and loading the car. The Contour Roam camera was a great success, it takes wonderful footage with its wide angle lens. What do you think about a race board? I am considering buying a race board. I am going to try one first at The Zu boardsports. They have an Airush Sector 60 on demo. good for low wind days - lots of bouyancy. good for speed runs - if I ever get to go out at Sandy Point. hard to turn/tack - gybe turn required? Have you tried one out? Any comments or suggestions? On the water again at Hampton, woo hoo! Out on the water again, at last. Stuart and I bagged a great session at Hampton first thing in the morning. My rib was fine. A few twinges, but it really didn't bother me. This breaks my "five week drought" of kitesurfing. I did a few small jumps but basically took it easy, just enjoying cruising around in the 1m bay swell. I headed upwind to the marina in search of some flat water, then headed downwind and followed Stuart out past Green Point. I was really enjoying skipping over the waves with a small boost - like a flying fish! I then setlled in for some nice "surf action" close to shore between the two rock groynes. There were several others out by then, mostly on kiting on surfboards. Stuart eventually made it back upwind on his 7m while I was "living large" in the waves. My Cabin Fever is now cured - for now at least. Two sea kayakers headed out for a fishing trip from Sandringham early on Tuesday 29 November 2011. They were reported missing that evening. Unfortunately, they were both found dead in the water the following day, with one kayak and body washed up near the Patterson River and the other located in the water just offshore from Seaford. Both were reported to be wearing life jackets. The kayaks were "sit on" craft that were setup for fishing and had small electric motors. You can see a paddle still attached to one craft in the photos, so they were equipped with a double-bladed kayak paddle too. 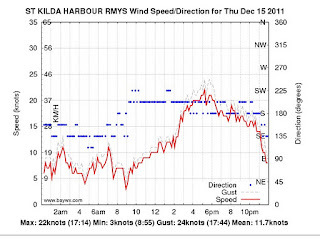 Looking at the wind graph for the day, strong northerlies came in during the morning, which may have blown them offshore and into difficulty. Around 2pm the wind changed to a westerly, also around 25 knots, which would have carried them across to where they were eventually found. There will be Coroner's inquest into this, but it may take a year or so to deliver findings. 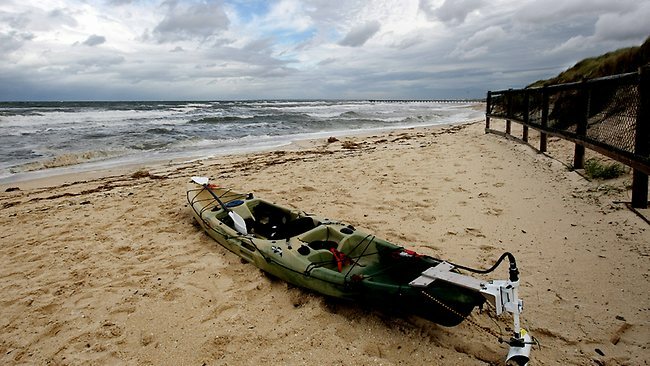 This tragedy highlights the need for caution on Port Phillip Bay with any water activity. It is well worth seeking local advice before heading out on an adventure, whether it be sailing, kitesurfing, fishing or SUPing. Check the weather forecast and if in doubt, don't go out. Consider carrying a Personal Locator Beacon. Tell someone your trip intentions before you go. Wear a wetsuit or equivalent clothing to keep you warm if you end up spending time in the water. You can get "hydroskin" and other specialist clothing for kayaking that allows good movement but can still keep you warm if immersed.